An original letter of correspondence between brothers and business partners Joshua Coffin Chase and Sydney Octavius Chase. 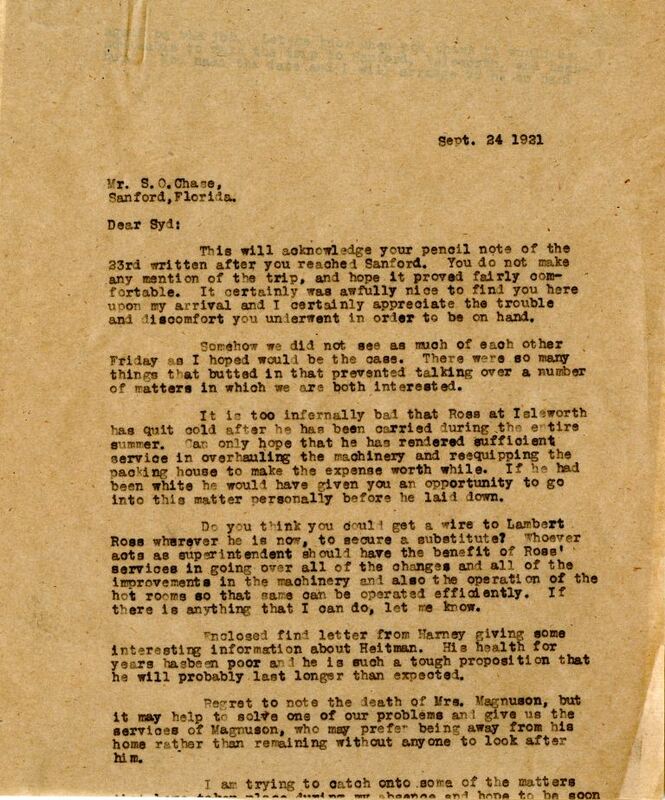 Topics discussed in the letter include Sydney's visit to Sanford, the resignation of Lambert Ross at Isleworth Grove, an enclosed letter from Mr. Harney about Mr. Heitman, and the death of Mrs. Magnuson. Original letter from Joshua Coffin Chase to Sydney Octavius Chase, September 24, 1921: box 49, folder 20.84, Chase Collection (MS 14), Special and Area Studies Collections, George A. Smathers Libraries, University of Florida, Gainesville, Florida. Digital reproduction of original letter from Joshua Coffin Chase to Sydney Octavius Chase, September 24, 1921. This will acknowledge your pencil note of the 23rd written after you reached Sanford. You do not make any mention of the trip, and hope it proved fairly comfortable. It certainly was awfully nice to find you here upon my arrival and I certainly appreciate the trouble and discomfort you underwent in order to be on hand. Somehow we did not sees as much of each other Friday as I hoped would be the case. There were so many things that butted in that prevented talking over a number of matters in which we are both interested. It is too infernally bad that Ross at Isleworth has quit cold after he has been carried during the entire summer. Can only hope that he has rendered sufficient service in over hauling the machinery and reequipping the packing house to make the expense worth while. If he had been white he would have given you an opportunity to go into this matter personally before he laid down. Do you think you could get a wire to Lambert Ross wherever he is now, to secure a substitute? Whoever acts as superintendent should have the benefit of Ross' services in going over all of the changes and all of the improvements in the machinery and also the operation of the hot rooms so that same can be operated efficiently. If there is anything that I can do, let me know. Enclosed find letter from Harney giving some interesting information about Heitman. His health for years has been poor and he is such a tough proposition that he will probably last longer than expected. Regret to note the death of Mrs. Magnuson, but it may help to solve one of our problems and give us the services of Magnuson, who may prefer being away from his home rather than remaining without anyone to look after him. Chase, Joshua Coffin. 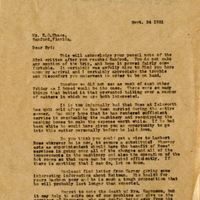 “Letter from Joshua Coffin Chase to Sydney Octavius Chase (September 24, 1921).” RICHES of Central Florida accessed April 18, 2019, https://richesmi.cah.ucf.edu/omeka/items/show/2747.